Kerstin Mueller Dembling received her PhD in German Studies from the University of Massachusetts Amherst, and she holds an MA in English and German Philology from Albert Ludwigs University of Freiburg. Her research focuses on intersections of history, memory, politics, and cultural production, and her most recent articles on German theater of the Holocaust and post-unification film appeared in German Quarterly, and the Journal of Austrian Studies. She regularly offers general education courses on contemporary Germany, and the history and cultural representation of witches, and seminars on 20th and 21st century German literature and film. 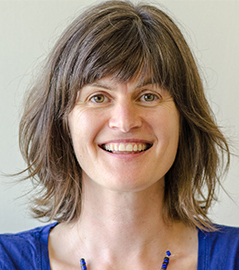 As the language program coordinator in GSS, professor Mueller Dembling is in charge of the elementary and intermediate German language sequence, and she instructs the graduate TAs in second language teaching methods.